So, you don’t like the idea of temporary term life insurance, but don’t want to pay the price of permanent whole life insurance. You’re not alone. Lucky for you, there’s a happy medium! It’s called Guaranteed Universal Life Insurance (GUL). What is GUL exactly? Keep reading to find out. In this article, we discuss the pros and cons of guaranteed universal life, and how to know if it’s the right choice for you. 1. What is Guaranteed Universal Life Insurance? Also known as “No Lapse” or “Secondary Guarantee Universal Life”, Guaranteed Universal Life Insurance is a much more affordable option in comparison to whole life insurance. Let’s break it down. Term Life Insurance is a type of policy that provides a guaranteed level premium and death benefit for a certain amount of years (known as the term). It is normally offered in increments of 5, such as 10, 15, 20, 25, and 30 years. Whole Life Insurance is a permanent form of life insurance, providing coverage for life – it has guaranteed level premiums/death benefit beyond age 100, as well as a guaranteed cash value. Since this type of policy delivers more perks and a longer coverage, the premiums are much higher in comparison to term life. That’s where GUL comes in. 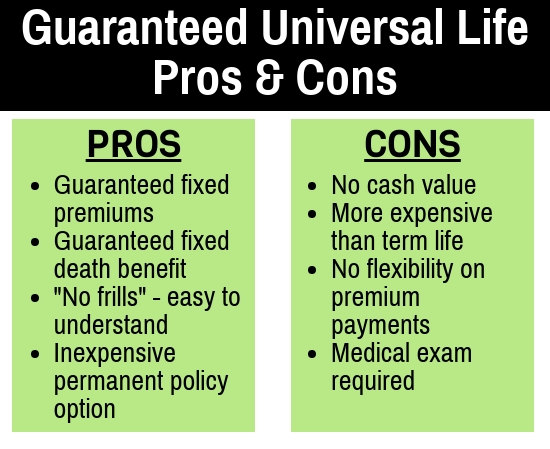 Guaranteed Universal Life Insurance is a nice mix between the two. This type of policy issues fixed rates until a specific age (such as 90, 95, 100, 105, 110, or even 121!) rather than a certain number of years (like term life). While the premiums are a little more expensive than term life, they are much more affordable than whole life prices. It is important to note that GUL does not accumulate guaranteed cash value like whole life does. We’ll cover the pros and cons of this policy in the following sections. Like we mentioned earlier, GUL provides premiums at a fixed rate for the duration of your policy that are guaranteed to stay the same until whatever age you decide (90, 95, 100, etc.). With a non-guaranteed universal life policy, the premiums can increase each year (also known as an adjustable cost of insurance), which is not good news for your wallet! Your death benefit is also guaranteed to stay level with a guaranteed universal life policy. This means that when you pass away, your beneficiary is guaranteed to receive an amount equal to what was invested, or the value of your contract on the most recent policy anniversary statement (whichever amount is higher). Unlike other policies (looking at you, non-guaranteed universal life), GUL does not have an investment component. With non-GUL, your investment/cash accumulation has to perform well in order for you to receive the same rate each year. If it doesn’t perform as expected, the cost of your policy increases. This means your cash value may decrease since you’ll likely use it to pay for your increased premiums. Since GUL doesn’t include an investment in its policy, you don’t have to worry about any of that. In terms of permanent life insurance policies, GUL is definitely on the inexpensive end. Tieing into what we said previously, non-GUL policies can increase in price each year to accommodate the cash value component. The cost of a non-GUL policy could be as much as 3-4x the cost of a GUL premium each month! While you can technically withdraw money from your cash value later on in life to pay for your higher premiums, it is not always a good idea to do so. This can put your coverage at risk, as taking a loan from your non-GUL policy decreases your death benefit until the loan is repaid (with interest). If you can’t pay back the loan, it’s possible that you could potentially lose coverage all together. With all that said, let’s move on to the cons about guaranteed universal life. With GUL policies, if there is any cash value accumulation, it is very insignificant. Most of the time, however, there is no cash value whatsoever. While other policies like non-GUL or indexed universal life insurance (IUL) have cash value accumulation, remember that it also comes with a risk of your investment failing. While GUL is very affordable in the grand scheme of permanent life insurance, it is still pricier than a term life policy would be. It all comes down to what your situation is, and how long you predict you’ll need life insurance for. If you only need a life insurance policy for a specific period of time, then term life might be a better option. However, if you’d like coverage for life, then GUL is the way to go! Unlike standard universal life policies, GUL policies do not allow for flexibility when it comes to payments. Missing or skipping a premium payment will run the risk of shortening or eliminating your guaranteed policy. Since guaranteed universal life policies do not have a cash value to dip into if you miss a payment, it is extra important to make sure you pay your premiums on time. Some whole life policies offer the ability to skip a medical exam while still receiving a policy, but GUL does not typically provide this advantage. Medical exams may seem like a big hassle, but they’re generally relatively painless (even more so if you’re in good health). A nurse comes to you at your convenience (you don’t have to go to a doctor’s office), and the whole thing usually takes 20-30 minutes. By taking a medical exam, it might allow you to receive a better quote when it comes to premiums, since it shows the life insurance company that you have nothing to hide about your health. What’s the Cost of Guaranteed Universal Life Insurance? Below we have provided monthly sample rates for GUL to age 90 policies ($250,000 vs. $500,000 coverage). The rates are for males and females in good (”preferred”) health from age 40 to 65. *Rates are accurate as of 03/15/18 and are provided for illustrative purposes only. Chances are, you may still have a question or two when it comes to picking out the right policy. That’s where we come in. Term Life Advice is an independent life insurance agency; this means that we have licensed agents who are not affiliated with a certain life insurance company, and can compare the pros and cons of each in relation to your individual case to make sure we get you the best rates possible. Our agents also do not work off commission, and won’t try to sell you a certain company just to meet the sales quota. We truly care about each individual, and want nothing more than to find you your perfect life insurance company match. We work with over 60 highly-rated life insurance companies, so chances are, we’re bound to find a company that works well with you! 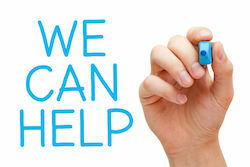 There is not cost to apply for life insurance and our comparative services are completely free. Give us a call today, or you can request a free online quote below to compare rates from more than 60 life insurance companies in less than a minute.